Hey LBB'ers! It's Thanksgiving time again and we'll give you plenty of reasons to be thankful for! Standard site cash-back rules apply. You have to redeem all the Fill Your Cornucopia codes to claim the $200 free chip. Contact Live Help to claim the $200 Free Chip code "CORNUCOPIA". 1X maximum cash-out, may only be credited once per player (only if you redeemed all required Fill Your Cornucopia codes prior to redemption) during the promo period, and is good for play in all allowed games. The Thanksgiving celebrations begin with a 523% free bonus on every deposit made on Thursday, November 23rd. Players can use their bonus right away on their favorite games. Those who make a deposit will also gain access to the Turkey Room from 8pm to 12am ET. 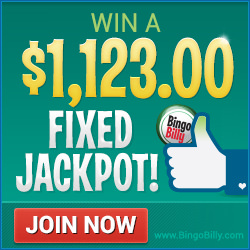 The room features a $1,123 fixed jackpot, three $23,000 to $123 guaranteed jackpots, Thanksgiving chat games, and more. New signups get a $30 free trial bonus, and first-time depositors are eligible for progressive bonuses worth up to 600%. More info could be found at Bingo Billy's website. Good luck LBB'ers and have a happy Thanksgiving!